I used to think of fried rice as a side dish, or a kind of boring main dish. Many restaurants make it with pretty basic ingredients—rice, corn, peas, carrots—which means it’s mostly starch. After four or five bites my mouth is a little bored. Every bite tastes and feels the same. That is, until a few years ago when my husband and I got a wild hair and moved to a rural island near our former home in Seattle. We had an opportunity to rent a stunning beach house just steps from Puget Sound—how could we say no to that? Vashon Island is a 20-minute ferry ride to West Seattle, which is like 15 minutes (without traffic) to downtown Seattle. I think we figured we were basically moving to a suburb of Seattle, and would be able to maintain our life—friends, office, entertainment, RESTAURANTS—with no interruptions. Thus we learned not to leave the island unless it was reeeeeally necessary. That meant we got to know all the island offered that much more intimately, particularly its restaurants. There were basically four: Mexican, sushi, American, and Thai. All of them were decent, but one of them was a standout. May Kitchen and Bar has won several awards for its extraordinary cuisine, and people come from far and wide to try it. May goes way beyond your standard phad thai (though they have that, too, and it’s presented with an elaborate table side lesson/demonstration). Their menu includes an amazing flash fried watercress appetizer the likes of which I have never seen anywhere else, a cashew veggie dish called phad metmamuanghimmaphan that I never learned to pronounce, and—finally bringing this full circle—a curried fried rice dish that is WAY more than just a side. And that’s where I got the inspiration for this cauliflower fried rice. 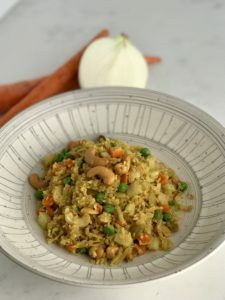 In addition to the typical veggies you expect in fried rice, May adds cashews and pineapple. It comes with meat but if you order the veggie version, you get mushrooms, peppers, and cabbage, too. Rather than make this more complicated with a number of extra veggies to cut up, however, I decided to boost the nutrition factor by swapping the rice for one of the most versatile veggies I know of: cauliflower. According to the Internet, cauliflower is full of antioxidants, phytonutients, fiber, and choline, which is good for learning and memory. So I think that means that in addition to being fricking delicious and totally satisfying, this meal will also make you smarter. Instead of pineapple, I like golden raisins. Less hassle, less waste, and I usually have them on hand. The cashews though, I cannot do without. Just make sure you roast them beforehand; they really do elevate the dish from tasty to terrific. Heat 1 tablespoon of oil in a large skillet over medium heat. Add the carrots, celery, and onion along with one teaspoon of salt. Stir well to combine and frequently thereafter. When the onions are transparent, add the peas, corn, jalapeno, tofu, and soy sauce (in case of a soy allergy, leave out the tofu and replace the soy sauce with 2 tsp. sea salt). Cook for another 5-7 minutes over medium low heat. You’ll know the vegetables are ready when the mixture is fragrant and the flavors have begun to merge. While the vegetables cook, fit your food processor with the grater blade. Remove the large leaves from the cauliflower head and cut it into pieces that can easily fit through the feed tube of the food processor. Grate the entire head (in batches, if need be). Transfer the cooked vegetables to a large bowl and heat another tablespoon of oil in the skillet over medium heat. Add the riced cauliflower, curry powder, and remaining salt. Cook the cauliflower for 8-10 minutes, stirring often to ensure even heat and complete distribution of the curry. Add the cooked vegetables to the cauliflower, along with the cashews and golden raisins. Adjust the seasonings as needed—you might like a bit more soy sauce or salt. Cook the mixture altogether for a few minutes over medium low heat and serve, garnishing with a few more cashews or chopped celery leaves, as you wish. Half a cup of pineapple chunks or small can of pineapple pieces is a nice alternative to the raisins, if you're so inclined. This recipe is a great way to use up bits of leftover veggies. I've "riced" small pieces of cabbage with the cauliflower and cooked them together, and added chopped peppers, broccoli, zucchini and eggplant to the cooked veggies with great results. Make it your own!